Elevated car seat wedge ends constant straining to see over the steering wheel and dashboard! Auto seat riser helps you see better and drive more safely. 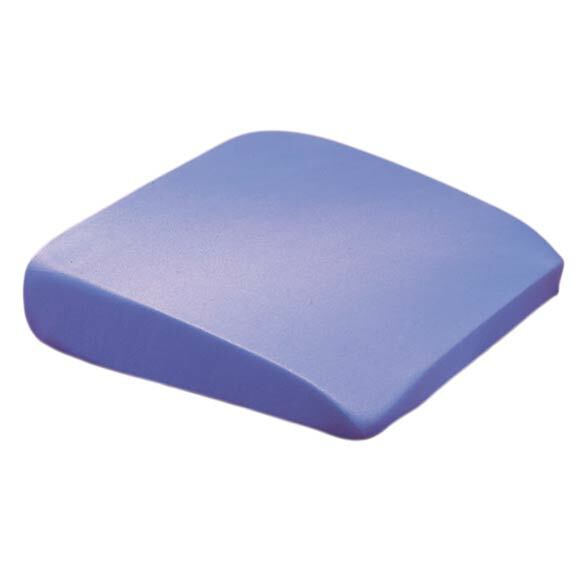 Firm 3" thick foam keeps you from sinking into car seat, helps improve posture, too. Includes machine washable 65% polyester/35% cotton cover; car seat riser measures 16" x 12 1/2". USA/Imported. I have bought several of these cushions over the years. I am very short and need one to be comfortable behind the wheel. They stay firm for quite a long time and the cover is washable. I like the silky material because it makes it easier to slide out of the car. Great product. Works like its supposed to. The wedge lifts me up in the driver seat to just the right height so I can see properly when driving. This cushion has changed....for the better!! Years ago I bought one of these cushions for the drivers seat in my car (Nissan Maxima) and it gave me extra cushioning, but didn't give me enough "lift". So I bought a second one, put it on top of the first one in the opposite direction of the first, and it worked well. Recently my husband and I have been making a lot of trips together in my Hyundai Sonata and I wanted the same cushions I bought before, to use on the passenger side of the car. I bought two cushions and was surprised when they came. They are now manufactured by a different company and are very supportive and higher than the ones I bought before. In fact, I only needed one cushion to raise me higher in the passenger seat. Before returning the second cushion I had bought, I asked my daughter if she wanted to try it in the driver's seat of her car. Well, she likes the cushion so much because it raises her up to see better, she's keeping it. I am pleased with my purchase. I have one for each vehicle. I have one for each vehicle. They give me the extra boost I need to see over the dash, as I am petite. I have had mine for years, the only reason I ever replaced one was because my puppy vomited all over it when we brought him home. Has held it's shape for years. We have a new Jeep Trail Hawk. I love my jeep, but the ride was rough. I looked all over for the car seat wedges (risers), but could find them no where. Then I remembered I had bought them from you before for my brother who had trouble seeing out the front windshield. So glad you still continued to carry them. They are the greatest! No other pillows work as well. Thank you for continuing to carry this product. before i got the riser cushion, I couldn't see any of the car.After riser its like sitting in a pickup--easier to see backing & parking. Easier on my hip replacement also. Would recommend to anyone. At last I can see over the steer9ing wheel. We use this as a lower back rest in the my Chevrolet Aveo 5. My wife just loves it used like that. Perfect for a shorter driver(me) to see over steering wheel. I had one of these auto seat risers........just bought 3 more. They're made a little different but still work to give me that extra inch I need behind the wheel. I also use one for my back support in my husbands car. Why did I buy 3? Can always use extras ?? I purchased the product because I bought a new Vehicle and I am short...I could not see the road. I am now able to sit comfortably in my new vehicle...Highly recomended. Because I'm short this lifts me up enough so I am now the right height for the lumbar cushion to be in the right spot. Before this wedge I was very uncomfortable in the car. So much better than using a regular pillow to help see over hood of vehicle. So far it has worked great. Jusst the right height so I do not have to adjust the mirrors each time I drive. Thnak You. This gave me the right amount of support as I am short and it made me very comfortable in my car. Can't believe I waited to long to purchase this! It raises me up just enough to relieve the strain in my neck. I didn't know I would feel so much more comfortable driving. The only downside is it slips from side to side a bit when I get in and out of the car, so I have to keep adjusting it. But that doesn't stop me from being very satisfied with my purchase. I use it in my car. I love to see over the hood of my car and this add to the level of the seat. Very easy for petite woman. I would buy this again because my husband loves it! My husband loves this car seat wedge. He has tried many others but this one fits perfectly, and has lasted a long time. I was however disappointed that it was just a top cover which left the underside sponge/wedge uncovered. The last one I purchased for him was a complete cover. I hope this one lasts just as long. This pillow is helpful for shorter drivers for better visibility. The wedge shape counteracts the bucket seat design that put you in an akward position. MY 2nd ONE. I USE BOTH TOGETHER - PERFECT!! I use the cushion when I am driving. I can see much better sitting on it. Purchased a used truck and the previous owners had caved the drivers side seat in, perfect to fill the gap. Also great for the cheap foldout chair at my desk. the cushion was for my 88 year old father and it certainly cushions a car seat for him! Elevates my under 5 foot body so I can see better and other drivers recognize that there's a person behind the steering wheel of our vehicle. Cushion works great. I own a 2010 Chevy Silverodo @ the seats set lower than my old Chevy. Due to lower back problems, I need to have my knees level with my hips, so most car seats create problems. This wedge helps fill the dip in the seat so I can sit as if it is a bench seat. Bought this for my 92 year old mother who sometimes still drives herself around. It raises her up just enough, and greatly improves her posture and position when driving or riding, because she uses it when I'm driving as well. In my car, now I can see the road better. Get's me up an inch higher so that I can see a little more around me. Not as firm as I'd hoped but it serves its purpose. I use this on the drivers car seat to get me up a little higher to see the road better. It isn't as firm as I had hoped but it does help. The width fits the "bucket" part of the seat as needed. My car seat has gotten compressed. This cushion does bring it back up high enough, but the puckered seat cover is not taut, and is uncomfortable. Also the short length of the cushion ending well before the car seat makes it uncomfortable. This was another good ideal, but it is too flimsy and went flat pretty fast. When I frist got this product It worked so good that I loved it, and had to lower the car seat level. How ever after about 2 weeks it went flat like the other reviewers say. I solved that problem by placing a stadium seat cushion underneat the high riser. So far all is well, and the 2 seem to stick together pretty good. Plan on buying velco to hold the 2 together. In all said,it is better then the ones I have seen in the auto supply stores. I am a senior driver who does about 100 miles a week. This is only 3 inches high! Good gracious! MUCH TOO LOW! And, it doesn't fit cars that don't have bench seats! What good is that? Miles Kimball used to carry a 5 inch high cushion that would fit in a modern car's seat. This one is much too low and doesn't fit to boot. Why did they stop carrying the one that worked? Thought the construction was nothing to brag about. It works OK but seems kind of shabby. I purchased this Car Seat Wedge because I'm short, and hoped it would help me see over the steering wheel. It is worthless!!!!! The foam has no substance and although I'm a petite 5', 110 lb woman, the wedge goes flat immediately when I sit on it. Don't waste your money on this item. I'm 5 ft. tall. I need the full 3 inches under me. I feel like a turtle on its back when driving. This pillow compresses so much it doesn't help much. They use to make very firm pillows for driving. Where have they gone? I'm 4'10, so I bought two of this product. After a few months the cushion felt flat, so I started using the second one and after a few months, it too started getting flat. Well, several years ago, I bought the same cushion and it lasted years. This is not the same product so I would not buy this again. I sent it back. Was too hard. Was too hard. Previous one I ordered was soft. I bought one for the car and another for my computer chair. They slide and shift in the car and are too soft to provide any additional height. Passenger seat on new vehicle low. Needed a wedge to see over dashboard. A firmer product would do the trick. Don't know if it's worth it to return. Because I need extra height while driving. I need one and couldn't find one locally. I'm unable to see above my steering wheel since I've lost inches in height. I needed a cushion riser to allow me to see better and I've seen this product in the sales magazine I receive from Easy Comforts. It is most appropriate for me to use in my new Toyota Camry. I love the one I had. Im short, I race off road jeeps with my boyfriend... Going to see if this helps secure me but high enough I can see over the dash. I am short and needed extra height for driving. This seems ideal for having a better view while driving. Other cushions I've purchased are not as high as this one is. I'm on a road trip and i'm sure this cushion will help my comfort. This helps seating in car more level. Bought this for a friend who has trouble seeing over her steering wheel. Purchasing for my wife. To help her sit taller in the seat. because of the wedge feature making it lower under the steering wheel. Mine is wearing out. Yours looked like what I wanted. I went from 5'1" to 4'11" and I need to sit higher in the driver's seat. My niece needs height in driving. The wedge shape may function to raise the driver's trunk for better visibility, yet elevate the feet only slightly to allow convenient access to the pedals. How does this seat wear, is it easy to get in and out of car? BEST ANSWER: I have a problem keeping the pillow in place. It isn't hard to get in, but I always have to straighten it out once I am in. Does this car seat riser measure 16" from front to back or from side to side? BEST ANSWER: Thank you for your question. The Car Seat Wedge measures 16" from side to side. We hope this information will be of help to you. BEST ANSWER: Thank you for your question. The height in the back is 3" and lowers to 1" in the front. We hope this information will be of help to you. The car seat wedge is two and a half inches high at the thick end, tapering to one inch at the thin end. BEST ANSWER: Thank you for your question. The cushion is foam with a 65% polyester/35% cotton cover. We hope this information will be of help to you. Where is the car seat wedge sold? BEST ANSWER: Thank you for your question. The car seat wedge can be ordered from our website or over the phone. We do not supply our products to stores to have them sold locally. We hope this information will be of help to you. It's sold only in the catalog. My elderly mother uses it in her car and it's just perfect.